No cars for sale at this time. I found the car in California and shipped it to Europe where it is now awaiting a full blown restoration. It is a 350hp 327 car with a 4 speed transmission and can be restored in the configuration you prefer. (Example picture of a previous Grifo already restored, price includes ALL costs involved, restored to client’s specs, delivered in Europe.) P.O.R. The car is sold and we started a full restoration on it. Thank you and congratulations, Peter! Totally correct and perfect recreation of the impossible to purchase early Grifo racer as entered in Le Mans. This gorgeous car has been built from original factory blueprints by the very same Bertone craftsmen who used to work in the Iso factory. A true piece of art, located in Clusone, Italy. 300.000 Euros This car has been sold and goes to a new California owner. Very nice example of this rare Series I supercar and it still resides with it’s original owner! This is a very nice looking silver car with blue leather interior, never any rust or accidents. Strong running, original 327 Corvette engine and 4-speed manual transmission – great deal! P.O.R. and SOLD, thank you. The car just finished restoration and is very well sorted, original 327 Corvette engine with quad Weber induction and 4-speed manual transmission. Red with black leather; flawless in every aspect. P.O.R. and SOLD, thank you. Another rare one, people! This is S4 number 23, it is in completely original condition (except for one repaint) and finished in original Argento with blue velvet interior. It is the special 350hp High Performance version of the Corvette motor and the desirable 5 speed manual ZF transmission (very unique, only 6 ever built!). It comes with lots of options like a beautiful burl wood finish on the dash and console. Italian delivered car with Belgian papers since 1976, garaged dry for some 20 years and now stored in Italy. P.O.R. Yes, you read that right, one of 13 ever produced and probably the last one not restored. These cars bring close to $400.000 when restored so here is your change to get one cheap. 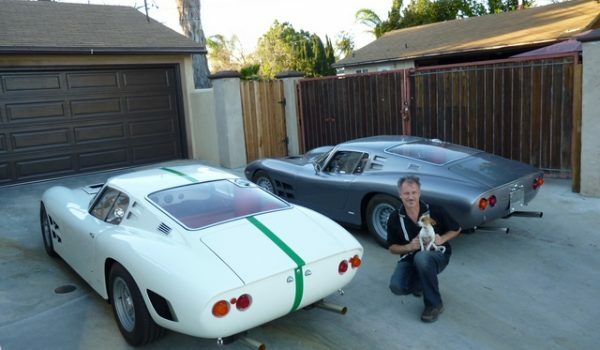 The car is well documented – was originally delivered to Germany from where it was shipped to California. Because of personal problems of the owner the car sat for 15 years without any restoration carried out. It was shipped back to Europe where it now awaiting it’s new owner. Car is extra desirable because of the Targa option with Air Conditioning. The original engine and trans (327 350HP Corvette with 4-speed) are lost but a correct 327 is included. The hood is?aftermarket but an original hood is included. Needs full restoration that will be WELL worth the efforts in the end! P.O.R. and SOLD, thank you. Yes, another rare one: one of only an handful produced and again one of the last to be restored. The car is well documented – was originally delivered to Germany where it sat inside for more than 23 years! The picture shows when it was pushed out of the barn in germany. The option list includes original Borrani wire wheels and the special manufactured exhaust manifolds for it’s 427 Corvette engine. The original engine and trans (427 450HP Corvette with ZF 5-speed manual) are lost, you will have to put your own drive train in. There is only very little rust, one large area visible on the left rear quarter panel. P.O.R. and SOLD, thank you! A very nice and well kept example of a very luxurious motorcar. The car has always been serviced well, has been repainted once to change the color scheme (from a dull Magnolia to a sparkling silver!) and still retains it’s original leather hides in very nice shape. Very stock engine compartment, smooth shifting automatic tranmission and ice cold air conditioning. I regularly take this car up and down the Pacific Coast (as the picture proves), a very nice and dependable driver with lots of class and good history. One of the last hand built Rolls Royces. P.O.R. and SOLD, thank you. A wonderful example of this rare Italian Sports car, fitted in red with saddle leather interior. Originally delivered to the US on 3/10/1973, this car now resides in Europe in heated storage. It has the desirable combination of the fast 4V 351Cleveland V8 engine and the bulletproof 5-speed ZF transmission – a winning combo. It remains in wonderful original conditon and is only sold because of emigration ot the owner. At this price, NOTHING comparable is on the market! P.O.R. and SOLD, thank you! Having gone through a multi-year restoration, this Stang is about as good as you can find them. I saw the car some 7 years ago for the first time when it was a father-son project, then it got accellerated into a full bare metal restoration through a Mid-West body shop. The restoration finished in 2007 and it looks as fresh as day one. The car is gorgeous, is fitted with all the desirable options and most parts are new or NOS. Comes with a 289 V8 and 4-speed retains it original Raven black color – now new Cragars but original rims are included. Email me for more specifics, a car not to lose out on! P.O.R. and SOLD, thank you. A super nice Challenger is desirable color scheme. Spent it’s whole life in California which makes for the total rust free body! Originally a 340 car with Air Conditioning and Slapstick console, the owner changed the engine to a HPO 383 Magnum with a 4BBL Edelbrock intake and carb. Highly updated and detailed engine compartment, smooth shifting 727 automatic tranmission. Large dual exhaust system with headers and four squa?e exhaust tips, power steering and brakes. Hoosier rear tires, front disc brakes makes it pretty much everything you could ever want from a muscle car. The interior is new and done very tasteful for the new owner to enjoy, the price wouldn’t be the problem: P.O.R. and SOLD, thank you. 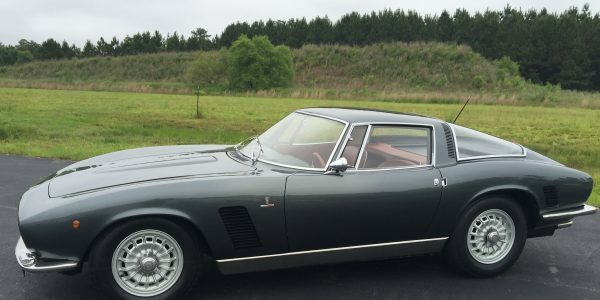 This 1967 Iso Grifo was the Paris Show Car in 1966 and was uniquely furbished for that event; it is fully documented from new on. The paint color is unique to this car and most insiders agree this particular car was ordered by Mr. Nuccio Bertone himself – making it an Italian delivery Grifo so rust has never been an issue. Afterwards the car was in Dutch hands for many years where I saw it in person; a nicely kept and serviced original Grifo with proud ownership. (M. Anderssen) It had tired paint and recently received a nice repaint in its original (factory) color over a very solid body. The rest of this car got nicely detailed and sympathetically recommissioned through expert detail work which brought back it’s old glory. It is equipped with the high performance version of the 327 Corvette V8, coupled to a 4 speed manual transmission and 3.07 De Dion rear end.